You can now borrow a bike in Tarves to cycle to Haddo Country Park. And it’s free to bus users. We will respond and asking what size and if you need to borrow a safety helmet. 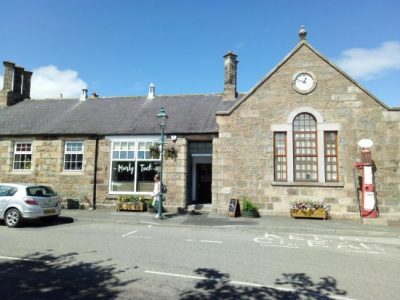 You’ll will either be met at the square or you will be asked to go to our community hub at the MURLY TUCK cafe in the square, where you will be given instructions, and the combination for the bike which is in the rack within the square itself. The purpose of the Tarves to Haddo bike link is to make access to Haddo Country Park easier for non car owners as there is no direct bus link to the magnificent house and park. You can use the 290 or 291 to travel to Tarves and there you can borrow the bike for free over half a day or more to access the park which is a 10 minute bike ride away. Getting a bus to Tarves is easy from Aberdeen central bus station, but there are also pick up points at Union Street near the Adelphi, at the University by Regent Walk and next to the Aberdeen Exhibition and Conference Centre at the Bridge of Don. If you need more than one bus, a Grasshopper ticket will allow transport within Aberdeen to connect to the 290 and 291 buses. 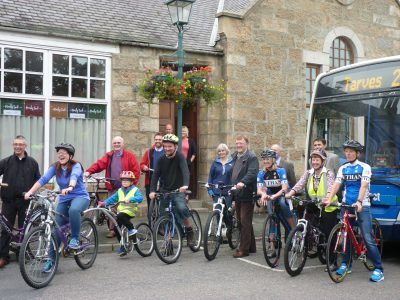 The bikes are re refurbished by Huntly based charity, Networks of Well-being, and while old, are perfectly serviceable.